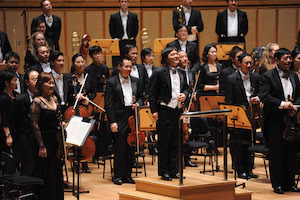 My very first live introduction to the Singapore Symphony Orchestra and guest conductor Alexander Liebreich was a huge disappointment on many levels. The entirely classical program (Schubert, Boieldieu, Beethoven)—on paper—appeared to be a veritable gem: two fairly well-known symphonies and a seldom-performed harp concerto that—especially in the capable hands of Xavier de Maistre—demands more frequent hearings. After a considerable wait, Schubert’s third symphony began with an Adagio maestoso that would become Liebreich’s hallmark for the evening: almost together. There is something in his body and stick technique that prevented the very capable musicians from producing razor-sharp ensemble, adding to the worldwide (it seems to me) epidemic of “good enough” performances. The Allegro skittered along happily (kudos to the principal clarinet, Ma Yue). Structure is everything in the Classical Era; the repeat was taken, but even on the second go the doted rhythms never felt secure. In the Allegretto, much more lift was required to ensure uniformity amongst the strings, winds and brass and provide forward direction—like so many maestros these days (cross-reference below), Liebreich seems content with constructing vertical rather than horizontal architecture. The Menuetto did have some moments of fun, yet slipping in and out of the trios was bereft of any sense of arrival. Finally, the closing Presto vivace was so fast that the excitement stemmed from whether or not the train would remain safely on the tracks. Nonetheless, the crowd seemed to enjoy this “reading” that most certainly fell well short of the composer’s intentions. Three cheers to harpist Xavier de Maistre who brought his considerable skills and musicianship to bear in Boieldieu’s contribution to the repertoire. From the opening trill (following a workmanlike declamation of the subjects provided by the orchestra, the soloist captured the ears, minds and hearts of the audience. The technical challenges were never a factor, everything moved along with aplomb. Deftly rendered triplets and well-realized sequences were at one with the French composer’s ideals and the second subject revealed the mystery of art where the introductory moment was just so. (One couldn’t help but be reminded of the ~1969 recording (Turnabout) by Marie-Claire Jamet with the Paris Chamber Orchestra—Paul Kuentz, conductor—where all of the component parts magically came together.) The Andante lento very nearly began with one mind; here, de Maistre demonstrated his subtle understanding of the harmonic shifts and discreet use of dynamics. Once again, the Allegro agitato would have benefitted with less is more from the accompaniments (the fine acoustics in Victoria Hall being able to fill in any “length of note” gaps). Nonetheless, de Maistre continued to dazzle the patrons with his artistry and sense of style. Here’s to much more from this excellent musician.